"Is that right? No!" students from Roosevelt, Prosser, and Steinmetz high schools yelled at a press conference today in front of City Hall. CPS cut millions from their schools, and is now planning to fund a new, unnecessary charter high school on the northwest side. Students spoke about safety concerns � the Noble Charter Network has plans to open a �David Speer Academy� High School at 5357 W. Grand Ave, across the street from Prosser High School in the Belmont-Cragin community. They also warned of increased budget cuts to their existing schools if they lose enrollment to the charter. Steinmetz College Prep High School junior Quijna Walton speaks out against CPS plans to create a new, unnecessary charter high school on the northwest side. The Chicago Plan Commission will vote on the Noble St. charter high school proposal on Thursday, Oct. 19.Parents and teachers also spoke about the need for more investment in the neighborhood schools that are already serving the community. Parents and students decried the regimented, punitive disciplinary tactics at Noble. Steinmetz teacher (and this reporter) Sharon Schmidt noted the vast services provided by a school with a "proud, 80-year tradition." "Our diverse students include the academically advantaged, those with special needs, and English language learners. All receive a college and career ready curriculum. Though Noble claims to have an open enrollment policy, it serves 13 percent fewer special education students and 19 percent fewer English language learners than traditional high schools." Schools like Steinmetz, with stable, veteran staffs, provide their students with dozens of clubs, sports, and special programs. In existing public schools, like Steinmetz, parents and community are involved in the oversight of the school, through elected Local School Councils. Union delegates and committees in the schools also provide oversight on work issues. Throughout the press conference, the students, teachers, and parents stressed that existing schools offer much to the community and deserve to be funded. Noble Charter Network has plans to open a �David Speer Academy� High School at 5357 W. Grand Ave, across the street from Prosser High School in the Belmont-Cragin community. CPS has sought no input into this plan from the Belmont-Cragin community and is trying to approve this plan as quickly as possible. CPS plans to approve a new high school in an area that has 6 CPS High Schools within a 1.5 mile radius. These schools have received $6.3 million in cuts last year alone. This new school will cost over $8 million over the next four years, while neighborhood schools continue to suffer. Community members have serious concerns about these plans. Noble Network pushes out students to increase their graduation rates, the plan would cost millions, and there are already six high schools within a one and a half block radius of the proposed location! Assuming the new Noble High School will start at grade 9, and will open an additional grade every year, it is estimated that this new school will cost tax payers $1.3 million dollars in opening costs in the first year. These are costs to pay for administration, operations, facilities and more. By the time the school opens to all four grade levels, Chicago taxpayers would have paid over $8 million. Every year following, this school will cost Chicago taxpayers $2.9 million in avoidable operating costs for the remainder of its existence. Within a 1.5 mile radius of the proposed school site, there are other high schools including Foreman, Kelvyn Park, North-Grand, Prosser, and others. Another school is not necessary, and a waste of money! These are millions of dollars that could otherwise be allocated to support neighborhood schools! If CPS has $8 million for Noble, CPS has money to reverse the budget cuts, and teacher layoffs in Belmont-Cragin�s neighborhood schools. In recent years, Mayor Rahm Emanuel has lavished praise on Noble, claiming they have a 90% graduation rate. Noble themselves advertises a 100% college acceptance rate. The Noble Network�s reported success has been both overblown and highly misleading. Though Noble claims to have an open enrollment policy, it serves 13% fewer special education students and 19% fewer English language learners than CPS�s traditional high schools. Furthermore, Noble�s application process excludes families that will have a more difficult time navigating such a process. Noble aggressively pushes out students! Many students are forced to leave Noble Schools each year. In 2011-12, Noble collected over $188,000 in disciplinary fines from its students, almost 90% of whom qualify for free or reduced price lunch. No need-based waivers are provided to families who cannot afford to pay. Students who have unpaid fines are not permitted to advance to the next grade level. 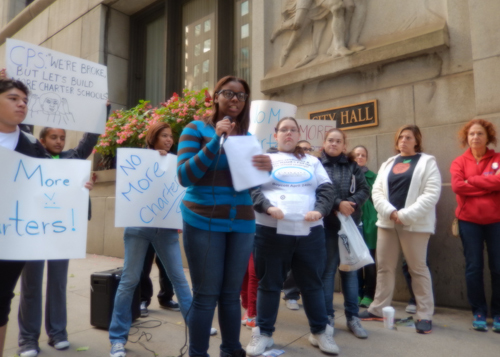 Noble expels students 12 times as often as Chicago Public Schools. In 2011-12, 527 of Noble�s 6,538 students transferred out. For example, 150 students began 9th grade at Noble Street-Rauner in 2007-08. Four years later, 102 students graduated and 72 attended college, far short of Noble�s misleading claims. Over the last year, the Noble Network has repeatedly refused to provide essential data that traditional CPS schools are required to provide. For example, students and parents have repeatedly requested data from Noble about disciplinary actions disaggregated by race and gender through Freedom of Information Act requests. Despite several attempts, Noble has refused to comply with the full request. This has prevented the public from gaining access to information that is vital for making informed decisions. As taxpayers, we demand to know the true numbers! As taxpayers, we demand that CPS fully fund our neighborhood schools and stop giving handouts to charter schools that are unnecessary, expensive, and hide information from the community! Really an amazing story since Prosser is considered by CPS to be within the "efficient" range in terms of utilization and is considered based on the CPS 2013 school performance rating policy to be a solid level 2 school that is trending up on every one of the CPS metrics. Given the goofy CPS rating policy Prosser in 2013 was only 0.8% in performance policy points away from being rated as a level 1 high school. For CPS to allow the Noble Charter Network to open the �David Speer Academy� High School at 5357 W. Grand Ave, across the street from Prosser High School is an affront to any concept of rational school planning based on demographics. There is no demographic projection for the Hispanic community in Belmont-Cragin area to grow. According to the CPS ten year capital plan here is the projection for this community: "Generated by U.S. Census?based forecasts, there is a projected 1.8% decrease in children aged 0?19 residing in the Belmont?Cragin area between 2011 and 2016 with a 7.0% decrease in children aged 15?19." I do not think Substance could have possibly written an article a topic that better depicted the planned destruction of traditional schools in favor of charter schools than the one that Sharon Schmidt wrote. Based on the empirical data there is simply no other conclusion that can be drawn in relationship to this planned Noble expansion other than CPS wants to use completion in the name of "school choice" to depopulate existing traditional public schools in the Belmont-Cragin area. I hope Karen Lewis decides to run for Mayor. hitting the bricks for her,including me. She has put 30,000 people in the street. She will have to decide what to do herself. But if she decides to go Rahm is toast. And so is this story. They will not rest until the only neighborhood schools left are dumping grounds for charter push outs. And where's our mayor? "ED REFORMERS MEET IN BOSTON � More than 800 state legislators, school chiefs and policy wonks of every description will convene today in Boston for former Florida Gov. Jeb Bush�s annual National Summit on Education Reform. The two-day conference will feature several big-name speakers, including former Secretary of State Condoleezza Rice and a mystery guest that summit organizers have kept secret to build suspense� though (spoiler alert!) your Morning Education team hereby unveils him as Chicago Mayor Rahm Emanuel. The summit features panels on everything from vocational education to pre-K to a strategy session on how to sell ed reform to the public. Added at the last minute: A panel at which top execs from four big companies, including Microsoft and Exxon Mobil, make the case for Common Core."